"Either she never learned to drive, or right after she bought the car, she realized that she had bought an Omega and was too embarrassed to be seen in it!" That was JaCG reader Dan's comment in the email he sent me with the link to this car. I love it! 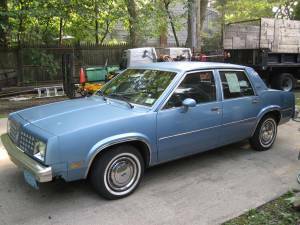 This Oldsmobile Omega has just 158 miles on it. One-hundred-fifty-eight. I know people who put that kind of mileage on their car everyday, just going back and forth to work. According to the seller, this car was "bought new in the spring of '82 by an old lady who never learned how to drive." Of course, if you're going to buy a car you'll never drive, you don't want to get a stripped model, so, "She ordered every option including all power options which is very rare for an Omega." I'll bet it is. Except for the battery, everything in this car is original. The fluids are still original! 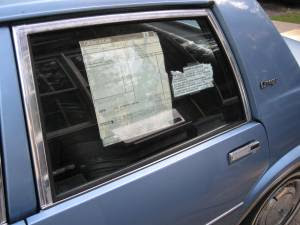 The new car window stickers are still on the car. There is one very odd thing about this car... If you look at the pictures, the bumper fillers are missing. No explanation is given. 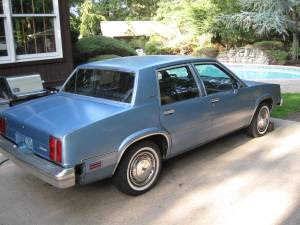 Until this moment, my desire to own a 1982 Oldsmobile Omega was about the same as my desire to own a rabid dog. (Actually less. In general, I really like dogs.) But, there is just something amazing about a 30 year old, 158 mile car. If I had the spare cash and, more importantly, the spare space, I'd buy this car. 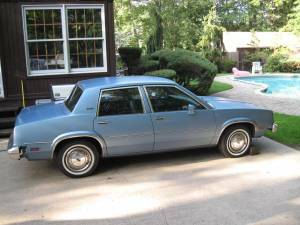 Located in Northern New Jersey, click here to see the Craigslist ad. "My car has visited the gas station only ONCE in THIRTY YEARS! Take that Prius owners!" Could the bumper fillers have simply rotted away? The one front shot looks like the front ones are a little wonky. Too bad it's not a Citation X/11. Well, that Hooniverse article at least explains more of why that car only has 158 miles on it, in that the elderly lady only wanted to have it around in case she needed it, and as she literally worked across the street she obviously didn't need it. Given that the price is pretty low given the mileage, hopefully it finds a home, even if it's someone who tries to sell it at Barrett-Jackson in a few decades and actually makes a fair chunk of change off of the sale. it's very cool that a car that old has managed to move so few miles, but I find it odd that whenever a car like this comes up it's always some car that nobody gives a crap about! It's never anything remotely collectable and really you could never drive it, I mean even if you got it for $7,000!! put more than 500 more miles on it and it's just another used car that you won't ever be able to get rid of!! Here's why this could be an interesting vehicle. It's obviously in incredible condition and will probably remain that way for a long time in the right hands. Even if used a little, the mileage is so low it still has quite an extended life ahead. There can't be many of these left. So at some point in the future, this one will probably be the only remaining Oldsmobile Omega on the planet. And that is definitely worth something. What price do you pay for scarcity?